Nicholas provides many exchanges dealing with religious points of view between himself and members of the website www.gather.com . 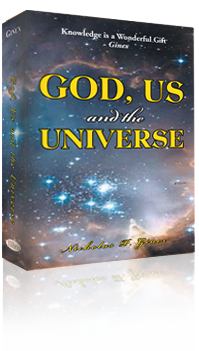 God, Us and the Universe presents 50 articles that have been stimulated by the historical novel, Future of God Amen. The comments and responses to the articles presented provides insights that reveals the author’s personal views. Nicholas responses to Gather member comments affords the reader greater scope to previous ideas about God, the soul, and what one has mentally conceived. The exchanges between believers in God, agnostics, and atheists provides an in-depth review of current religious thought. God, Us, and the Universe offers many perceptive thoughts and ideas concerning religious dogma and why the Judaic, Christian, and Islamic religions must meet the challenge to unify their beliefs and teach the Word of God – love one another. Nicholas has a passion to present findings by renowned Egyptologists and respected religious scholars that have not been revealed to religious followers. His writing skills surfaces knowledge of a religious past that deserves to be known by the modern world. The articles reveal his personal views about God and the challenges for Judaic, Christian, and Islamic religious leaders and their followers. Book features a Foreword, Table of Contents, and an Epilogue.